Craig Hollander has been a beloved and trusted expert in holistic nutrition and a certified fitness trainer for years. Once a picture of perfect health, his life has permanently changed and he needs our help. In December before the holidays, Craig was admitted to Cedars-Sinai hospital incapacitated from a debilitating Staphylococcus Aureus infection that had attacked his spine and was traveling throughout his bloodstream (septicemia) threatening his life. The profound infection had not only caused osteomyelitis of his spine, but had traveled between the T7 and T8 vertebrae going all the way to his spinal cord. The surgeons tried intravenous antibiotics but the infection had deteriorated part of those vertebrae and wasn’t clearing from his body. 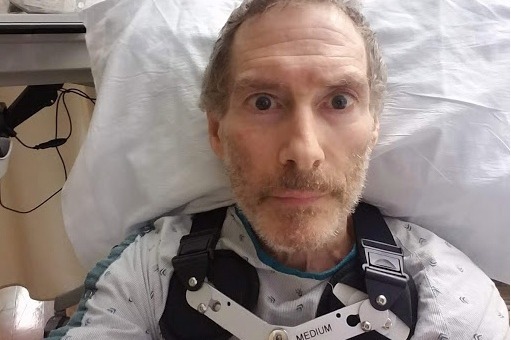 Craig was told that he would need spinal surgery not only to remove the infection, but they would have to do a laminectomy of the T7 vertebrae, and they would have to put metal rods and screws from T5 to T10 to secure his spine from further collapse. The surgery was done leaving Craig in horrendous pain which hasn’t been relieved as of the present date. Craig, who once lived at the gym, is now completely bedridden for most of the day. The T7 nerve is being compressed when Craig is sitting or standing, leaving him in constant, chronic pain. He has to self-administer antibiotic IVs three times per day because he can’t afford a nurse. He can’t have physical therapy because his insurance won’t cover it as an outpatient. Craig has lost 25 pounds of muscle weighing only 118 lbs. and can’t gain weight because the infection is utilizing his calories. He can no longer work because he is limited to lifting only 5 lbs. because the rods and screws in his spine can rip out with heavier weight. He has no income and no disability insurance. Craig’s closest family member is his elderly mother 3000 miles away. He was a musician before transitioning to a bodyworker, holistic nutritionist, and personal trainer. He loves music, art, but most of all helping people that are in pain or haven’t been successful with traditional medicine. The bills from the hospital, labs, medicine, and doctors are accumulating. Craig is facing a more invasive surgery if the IV antibiotics don’t relieve the compression on the T7 nerve. He can no longer work at the present time. Craig’s gratitude for any support is an understatement. He lives alone and has friends throughout the USA for emotional support, but needs your help at this time. This is such a humbling, scary experience and your love, caring and assistance means more than you will ever know.